The amazing running back for the Cleveland Browns of the National Football League, Duke Johnson, has been labeled a bigger version of Chris Rainey by Muschamp who described him as a footballer with great competitive nature. According to Muschamp, the dude can full-speed, one-cut, and at the same time, get the ball vertical. He has the capability to make people miss in space, he also runs tough, runs hard and makes his receptions count. The player with a soft-spoken demeanor and the impish smile was drafted by the Cleveland Browns in the 3rd round of the NFL 2015 draft as the 77th overall and the sixth running back drafted in that year. Recently, he signed a three-year $15.6 million extension contract that will last through 2021 with his current team, the Cleveland Browns. Duke Johnson, whose given name is Randy Michael Thaddeus Johnson Jr. was born in Miami Florida on the 23rd day of September 1993. The American national was born to Randy Johnson Sr, who died in 2008 of amyotrophic lateral sclerosis when Duke just turned 14. His mother Cassandra Mitchell is now in a second marriage to Miami Beach police detective Duane Mitchell. Duke’s educational background can be traced to Miami Norland Senior High School in Miami Gardens, Florida where he was a three sports standout, majoring in football, sprinting, and long jump. After his graduation from high school, Duke proceeded to the University of Miami where he played football in his junior years but had to forfeit his senior years to allow him to declare for the 2015 National Football League Draft. The American-born football player stands at a height of 5 feet 9 inches (1.75 m) and weighs 95 kg (210 lb). However, the summary of his general body statistics is still not known. During his days at Miami Norland Senior High School, the rising star was active in both football and track events. The emerging star led Norland to a 13–2 record and state runner-up in his junior year, beat Sammy Watkins and also led South Fort Myers 44–28 in the semifinals but lost 44–34 to the unbeaten Tampa Jefferson in the Class 3A final. In his senior years, Duke led Norland to a 15–0 finish and state Class 5A championship. Duke Johnson was a standout sprinter and also a high jumper in high school, as part of his school’s track & field event team, the multi-talented sportsman came 5th with a jump of 6.60 meters in the long jump qualifiers event at the 2010 GMAC. He recorded a career-best time of 10.62 seconds in 2011 when he got the fourth position in the 100 meters at the 3rd Annual Miramar Invitational. At the FHSAA 3A District 16, the young athlete came 3rd in the 200 meters race at 22.31 second. Rivals.com considered him as the best all-purpose running back recruit. His college football career at the University of Miami spanned through 2012 to 2014. He recorded outstanding career statistics which led to winning two awards namely; Offensive Rookie of the Year and the ACC Rookie of the Year awards, making him the first Miami Hurricane ever to bag the two awards. When he fractured his ankle against Florida State on the second day of November 2013, his sophomore campaign with the Hurricane football team came to a sudden end. He played in all 13 games in his junior season when he returned from the injury in 2014 and went on to become the Hurricanes’ all-time rushing yards leader ahead of Ottis Anderson. 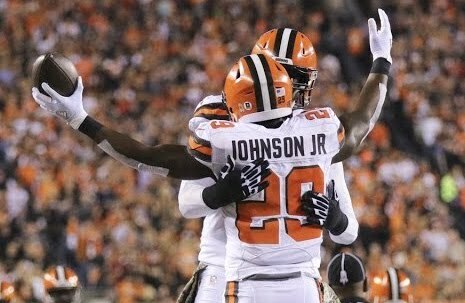 Duke Johnson made the conscious decision to declare for the National Football League Draft of 2015 and forgo his senior season after recording outstanding stats in his junior season. The self-proclaimed Mama’s boy actually tattooed his mother’s image on his left shoulder, according to him, apart from his Canes, his mama is his world. He went further to say that everything he does in life is to please her and in her absence when he cannot talk to her as much as he wants to, he will just have to look over his shoulder, and she is always there. The famed sportsman got his nickname Duke, from his mom’s grandfather – Duke Coleman, who brought his mother up in Georgia, although his real name, according to his mom, is Randy Michael Thaddeus Johnson Jr. The American footballer has been named to second-team Walter Camp All-American and as Atlantic Coast Conference Rookie of the Year. He received another outstanding accolade in 2011 when he was named Mr. Florida Football as the state’s Class 5A Player of the Year.